This is always a great time of year to thank God that you're not a pilgrim. Just kidding, pilgrims. But seriously, this is a great time of year to think about what you should be thankful for. We live in the greatest, most free, most productive country in the world. We are surrounded by genuinely good people who believe in community, charity, and fair play, and millions of people work tirelessly to make everything a little bit better every day. Who can beat that? Besides that though, we should all be thankful for our friends and family and for the chance to make their lives better as they've made ours better. It's a great time to remind them that you love them, isn't it? 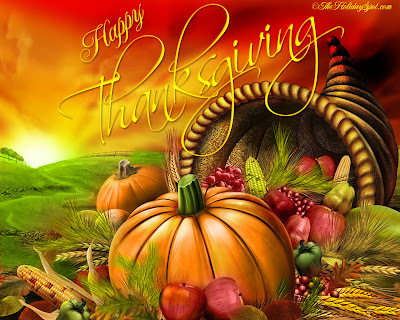 Personally, I'm thankful for my wonderful parents and my great sister, my incredible wife, and my amazing kids. I'm thankful to be alive. I'm thankful that I get to see and experience everything this world has to offer. I'm thankful for e-meeting all of you. And I'm thankful that we can experience things like joy and happiness and contentment.